Treyarch has offered a preview of Call of Duty: Black Ops 4‘s next update, which is scheduled to go live on January 15, marking the start of the game’s 115 Day Celebration Event. For Zombies, update 1.11 will add new Gauntlets and three new Epic Elixirs on the PlayStation 4 alongside Elixir balancing updates. Treyarch is also testing some new Concoctions, and has promised to detail new content coming to the mode over the next few months. The 115 Day Celebration Event will kick off on January 15 at 10 am PT on all platforms with Zombies 2XP, Zombies 2X Weapon XP, and 2X Nebulium Plasma. Blackout mode on consoles will receive an improved looting interface that allows players to “scroll through a multi-row grid, loot the items they’re looking for, and get back to the action as quickly as possible.” This update will address some UI issues that console players have been experiencing. Update 1.11 will add Elevation and Madagascar to full map rotation in multiplayer for Black Ops Pass holders. 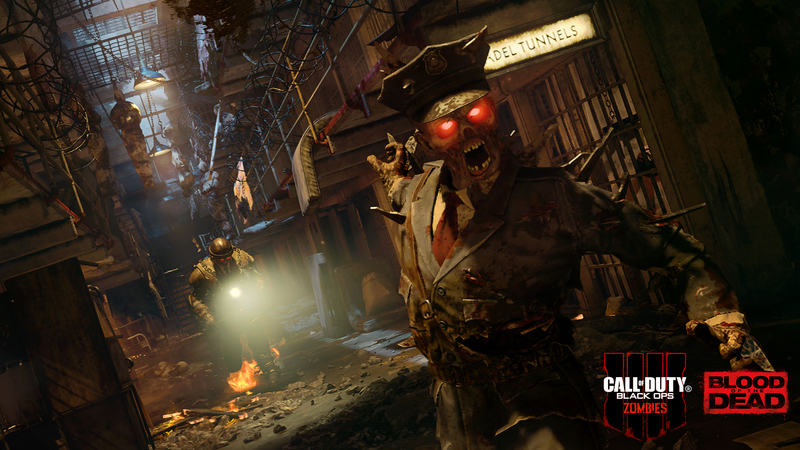 Going forward, Treyarch will add new multiplayer maps to full rotation after release. In addition to the above, a “fresh batch” of rotating featured playlists is coming to multiplayer starting next week. The mode is also set to receive stability fixes and quality-of-life improvements. Detailed patch notes will be released early next week so stay tuned. Call of Duty: Black Ops 4 is available on the PS4, Xbox One, and PC. For more on the game, check out our recent coverage.